Editorial – It’s not all Gloom and Doom! I am told that “May you live in interesting times”, is often referred to as the Chinese curse. I don’t believe in curses in any providential sense, but it is true that, as professional historians, we are living in interesting times. There is much about our present context that makes it difficult for a historian as an independent and credible scholar. Digitalisation of historical resources has come at a price. Certainly it speeds up the research process and makes it even possible to access sources which were too distant to make it unfeasible to organise a research trip. It cannot be all put up online. The trip to the archives (hopefully not too far away) is still a necessity, and given the volume of archival material, it will still be a necessity for a long time to come. However, what the trained scholar has access to, so has the amateur historian. There is no problem in the fact that increasingly many folk now wish to take up the role of the amateur historian, nor is there a problem in the archivist making it easier for the disciplinary-untrained to do history work. Most archives have a public obligation to make material freely-available. The difficulty doesn’t lie here. Few people have made a greater contribution to excellence in Queensland history as Dr Ruth Kerr has, and continues to, over a career spanning forty-five years. 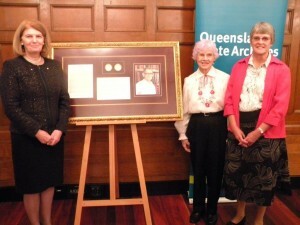 In her teaching, research, publications and involvement with Queensland State Archives, Queensland Parliamentary Library, a range of Queensland Government Departments, the University of Queensland, the Royal Historical Society of Queensland, the Australian Mining History Association, the Professional Historians Association of Queensland and most of Queensland’s local historical associations Dr Kerr has contributed diligently and generously to advancing our knowledge of Queensland’s history.